It’s been a while, I know. But I promise I’ve been really really busy. For example, two weeks ago I was in England, hopping between London, Cambridge and Leeds as I re-connected with some of my all-time favorite foods. After 30 painful months of separation, I am in love, all over again, with British food. 1. British breakfasts are awesome. Yes, fry-ups are bad for you, but that’s not what I’m talking about. I’m talking about variety. As much as I love bagels, cream cheese, capers and lox and even though I’ll admit to sneaking eggs on a roll with Tabasco from my local street cart every so often, New York’s breakfast options are surprisingly limited beyond that. And no, I don’t really consider Dunkin Donuts or Krispy Kreme to be purveyors of real breakfast food. For starters, there’s EAT. Yes, they’re a chain but they’re also dedicated to fresh, quality food. EAT serves a delicious selection of toasted breakfast sandwiches, muesli, granola, yoghurts and fruit salads. EAT doesn’t buy a single mass-produced sandwich, soup or salad – they make everything fresh in their own kitchen with a one day shelf life. 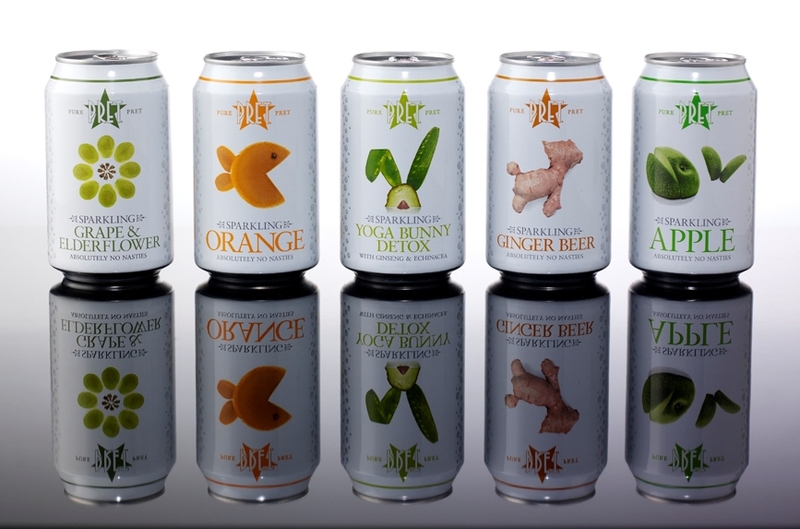 High on their heels is Pret A Manger which, like EAT, prepares its food fresh every day (each store has a kitchen), abstains from any “factory stuff” and changes its menu regularly to incorporate seasonal ingredients. Pret started in 1986 as a London venture by college friends Julian and Sinclair; today the company has 240 stores. 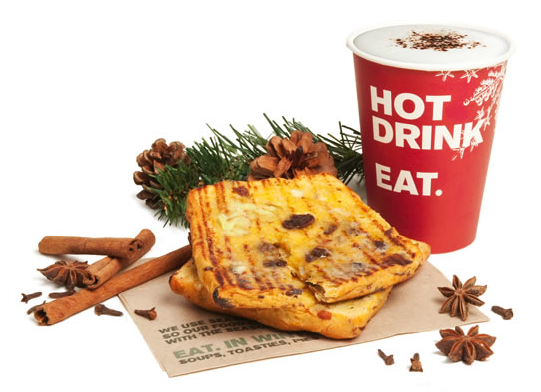 They’ve always been a socially conscious business, giving leftover food to charities, but this year Pret launched the “Really Big Christmas Dinner“, whereby they will donate 5p from every sandwich sale through Nov and Dec to hot Christmas meals for the homeless. While I personally prefer the breakfast food at EAT, Pret has been more successful / aggressive about growing the business. Besides offering a wider variety of products, they have grown their presence in several American cities as well as parts of Asia. 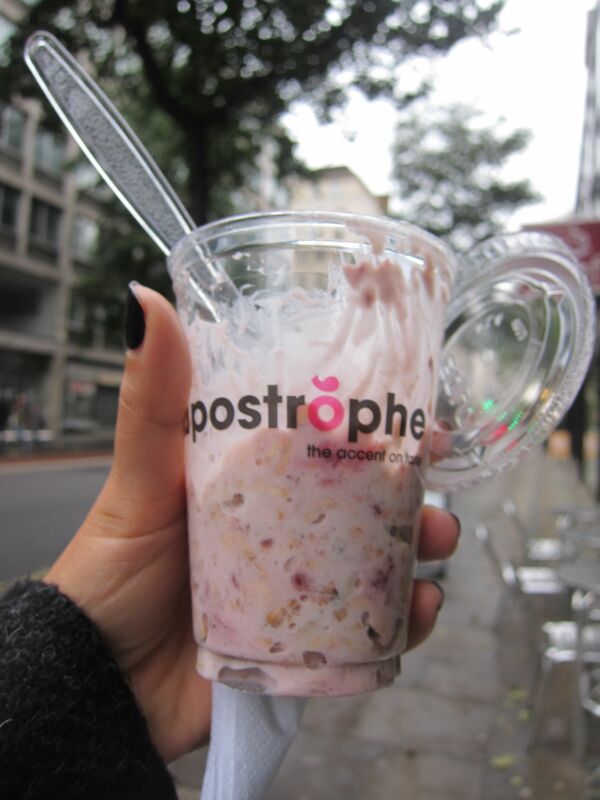 There’s also Apostrophe, a modern London take on the boulangerie-patisserie, and Innocent Drinks, a fantastic company that makes delicious smoothies and breakfast thickies with 100% pure and fresh fruit. So yeah, British breakfasts are awesome and worth missing. Bircher Muesli (Jamie Oliver recipe here), REAL bacon, sausage rolls, fresh yoghurt pots (none of that giant, mass-produced, sugary parfait stuff) and yes, a “Full English” are all hard to come by in the States. Sarnies, butties, baguettes, paninis…. call them what you will, they run rings around their American cousins. And to be clear, I’m not talking about artisanal American sandwiches, prepared with whole grain mustard aioli, Vermont cheddar and what not, I’m talking about the average grab and go American sandwich, vs. the average grab and go British sandwich. First is the issue of height. I am well acquainted with the bigger is better way of American life, but there is really just nothing pleasant about 3″ of bland meats and salads packed inside 2″ of bland bread, held together by what looks like a toothpick. No one can fit a real American sandwich in their mouth… and even if you somehow manage it, you’ll probably end up eating an entire piece of meat or a bland tomato slice because the fillings aren’t chopped up. Throwing together a bunch of coarsely chopped ingredients with some mustard and ketchup does not a sandwich make. Second, is the issue of cheese. The average American sandwich contains American cheese, a processed cocktail of emulsifiers, preservatives and colorings engineered to melt obediently at the slightest application of heat. Finally, there’s the issue of the bread. I don’t know why but whether you order a sandwich at your local deli, restaurant or cafeteria or buy the bread at a supermarket, American bread just doesn’t taste as good. 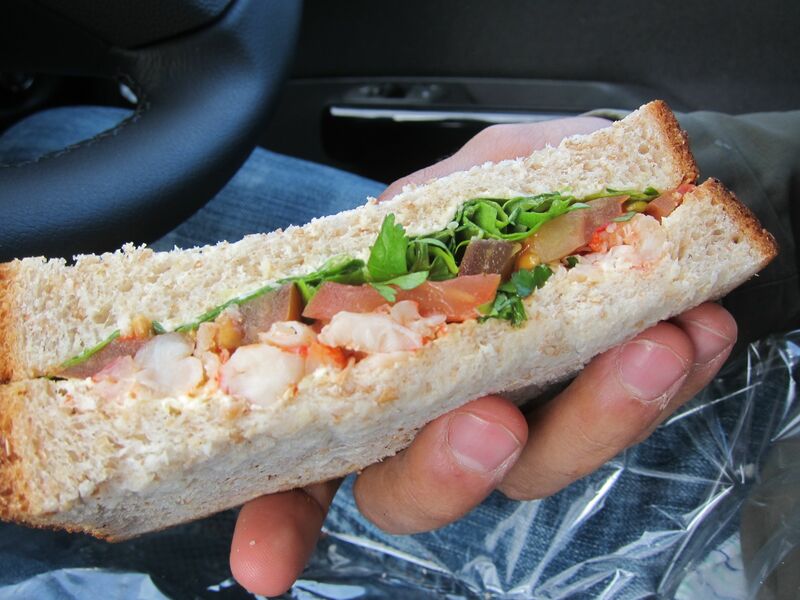 In contrast, the average Britain sandwich offers you Crayfish and Rocket (yes, instead of watery iceberg lettuce), Cheddar and Branston Pickle, Egg & Cress…multigrain, wholegrain, German rye… the options are endless. As much as I respect America’s penchant for pie-baking, England definitely wins when it comes to the sweet stuff. Maybe it’s proximity to chocolate-loving Belgium and dessert-loving France, maybe it’s a history of cakes and trifles, no matter how you slice it, the Brits come out ahead. England has chocolate digestive biscuits and Cadbury’s. ’nuff said. Oreos and Hershey’s taste like cardboard in comparison. If you’ve ever visited Borough Market, you’ll know that it puts even the San Francisco Farmers’ Market to shame (which, for the record, is fantastic). Hundreds of small artisans, wholesalers, foodies and retailers flock to this bustling space each Saturday to partake in the exchange of local ‘honest’ food. Wander past the cafes and al fresco restaurants to take in the colourful displays of fresh fruit and exotic vegetables. Nibble on stilton and shropshire and sample the pungent patés and spicy curries. Recharge at the fresh juice station and sip on mulled wine and hot cider at the beverage corner. 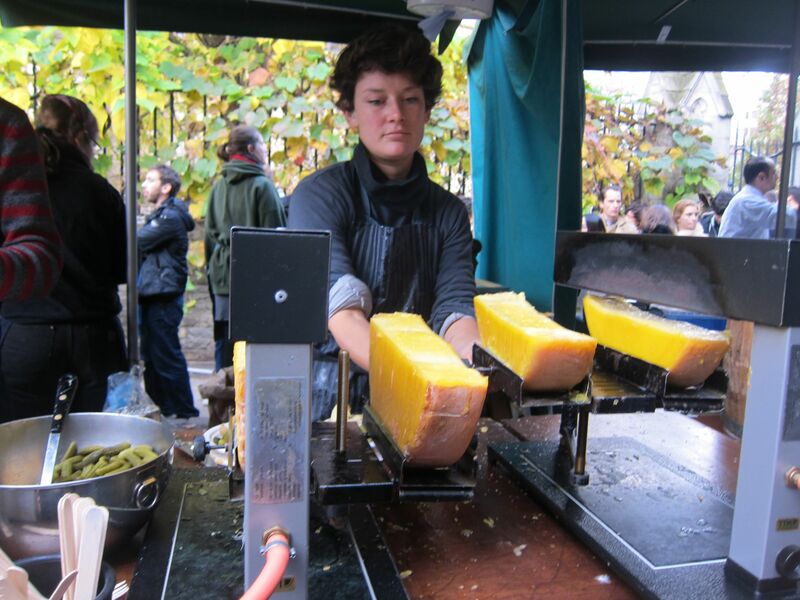 If you feel up to it, stand in line for a serving of rich, gooey raclette or for a freshly grilled burger. 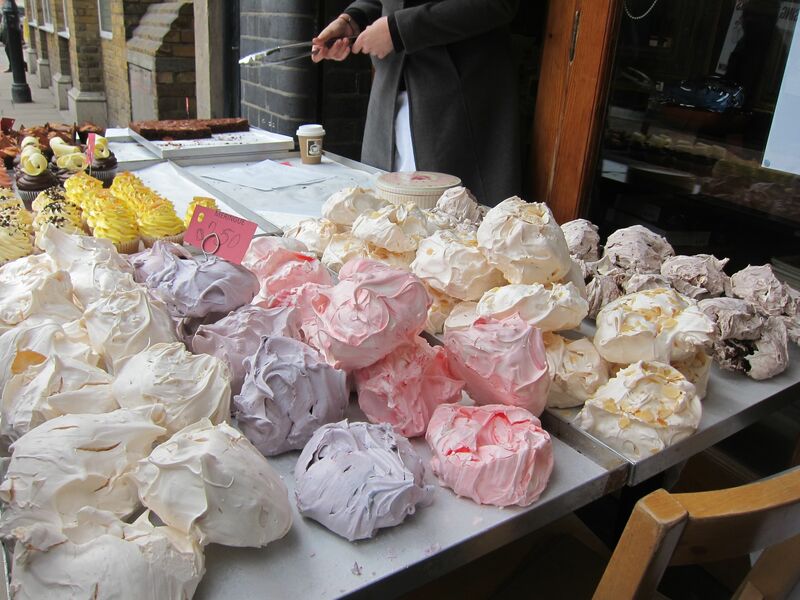 Munch on your meringue, pick up some elderflower jelly and make sure you pack some Turkish delights for later. I hate using the term ‘ethnic foods’ so I’m going to boil this down to the crux of the argument: England is really good at sussing out the “best” [insert cuisine type] dish and selling it en masse. Rather than view this as an adulteration or departure from authenticity, I consider this a warm embrace of “foreign” culture by a hungry British public. I love that Chicken Tikka Masala, or CTM as it is affectionately known, is India’s national dish, but only in England. I love that people go bananas over an £9 chicken wrap at Nandos and I love that I can buy taramasalata in pretty much any grocery store. England’s physical and psychological proximity to Continental Europe, Asia and Northen Africa uniquely positions it for access to a variety of rich culinary traditions. Joking aside, Indian food (as an example) has progressed well beyond the ubiquitous CTM and made its way into the vernacular and essence of British life. It’s pretty easy to walk into one of Masala Zone’s many London outposts and walk out 20 minutes later with a happy tummy full of lamb roganjosh. The same applies to the mind-blowing Lebanese food at Maroush, which you will likely encounter 11 times while walking down Edgeware Road. I could go on for a while in defense of what has come to represent British food, but I’ll stop here. My point is certainly not (entirely) to rail on American food since I’m a big fan obviously, but to point out just a few of the highlights of food in England which is by no means inferior to food in America. If you’re still hesitant to skip the pond and see for yourself, I’d encourage you to try some classic British dishes like shepherd’s pie and Welsh rarebit or indulge in some cream tea, a Sunday roast or even just some fish and chips. Until then, enjoy the pics! I know – so good 🙂 British food certainly isn’t worthy of its bad reputation! 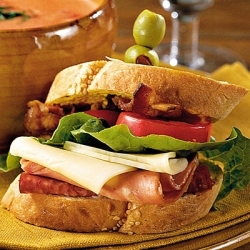 Sandwiches…they are too good, and you can never be tired of the combos. Usually people say English breakfasts are mostly porridge and bread. Really wonder whoever said that !!! Wow, thanks for the Bristish food education. So much information!